LOS ANGELES, Calif. – September 27, 2016 – Helinet, a leading provider of aviation technology solutions to the law enforcement markets, successfully delivered two Bell 429 helicopters to Nassau County Police Department, significantly strengthening their airborne division. The aircraft have been equipped with customized airborne law enforcement solutions for the Department’s Aviation Bureau, which played a crucial role in the security of Monday’s Presidential debate. 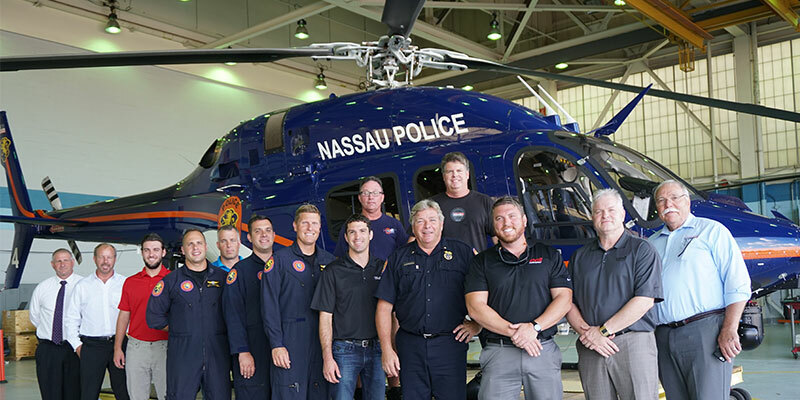 The Nassau County Police significantly raised the bar on their airborne law enforcement capabilities with the incorporation of the helicopters. Crowd control was among the top priorities for the Nassau mission during Monday night’s Presidential debate at which thousands of protesters gathered. In addition to the Nassau County aircraft, Helinet’s Technology Group also provided surveillance support with a high tech ISR aerostat balloon system. The fully integrated, lighter than air platform with multi-payload capabilities, was deployed allowing for additional intelligence and surveillance imagery to be fed to command staff on the ground. Along with equipping the Department’s Bell 407 helicopter, the two new Bell 429 aircraft are configured with complete real time mapping systems and aviation wireless downlink technologies. Helinet also outfitted receive capabilities at a fixed command center and two mobile command centers. The microwave downlink system provided real-time transmission of HD imagery and data from the department’s helicopter fleet to ground-based command centers and portable receivers used by officers in the field during the debate. The aerial capabilities became a force multiplier, and was an essential tool for effectively deploying over 1,000 officers to maintain order and ensure public safety. As other sectors such as air medical and utility infrastructure continue to incorporate aviation technology, Helinet’s approach to customized solutions has established the company as a leader in the industry. The understanding that there is no “one size fits all” solution is backed by expert on-call 24/7 support and has been key to earning the trust of law enforcement agencies worldwide.